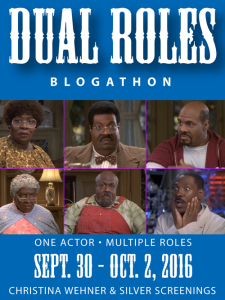 The Dual Roles Blogathon Starts Friday! Yahoo! The Dual Roles Blogathon starts this Friday, and we can hardly wait! Christina Wehner and yours truly are co-hosting this event from September 30 – October 2. If you haven’t signed up yet, it’s not too late to join in the fun! Click HERE for blogathon details. 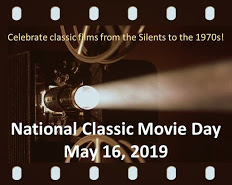 Any film from any time – from the silent era to the present – are welcome. Duplicate roles can include anything from one actor playing multiple roles to one character playing multiple roles. For example, Ginger Rogers in The Major and the Minor plays (1) herself, (2) a child, and (3) her own mother. Join us any day you like, and we will include your post in that evening’s recap. Click HERE for the list of the participants. This is going to be great – doubled, multiplied, duplicated, replicated, squared…lots of fun! I’m seeing double! Can’t wait. Haha! I can’t wait either! Seeing as you’re accepting duplicate entries I’m going to try and rustle up a post. I’ll see you on Friday when the fun begins! Yes. I so wanted to write about Kenneth and Emma in Dead Again (I mentioned it months ago but never signed up). That’s my life in a little nutshell. And it’s been taken, anyway. I know you are allowing duplicates but… We’ll see. 🙂 Either way, looking forward to this! Some great movies in that list. Oh yeah, some fab movies in this list. I can’t wait – whee! I hope you’re able to join us, but no pressure. Can’t wait for this blogathon. I’m expecting my post to be a little late, as I’ve been suffering with writer’s block a hell of a lot, and I’m finding myself struggling with posts because of it. Thanks. I’m trying my utmost hardest to have it published by tomorrow. I hate being late. Wish I didn’t have so many things to do or I would have participated. Sounds like it’s going to be fun. Maybe next time! Yes, maybe we can conscript – er, I mean, volunteer – you next year! Hi there! I posted a little early, so here’s the link for whenever the grand “The Blogathon Is Here!” post goes up. 🙂 Thank you (and thank you Christina) for hosting! Excellent! Sorry for the late response, but I’m looking forward to checking out your post this afternoon. Christina will include you in tonight’s recap. Looking forward to reading your thoughts on Deborah Kerr. I love her in Colonel Blimp. Hi Ruth. I tried my utmost hardest to have mine completed by today, but I’m still working on it, and won’t have it completed until tomorrow. Looks like this one has already started but all that means is that I won’t have to wait to read them all. Yay! There are some wonderful posts in this blogathon, as well as a huge array of films. It’s a cornucopia of movie treats!